Marine microorganisms are defined by their habitat as the microorganisms living in a marine environment, that is, in the saltwater of a sea or ocean or the brackish water of a coastal estuary. A microorganism (or microbe) is any microscopic living organism, that is, any life form too small for the naked human eye to see, needing a microscope. Microorganisms are very diverse. They can be single-celled or multicellular and include all bacteria and archaea and most protozoa, as well as some species of fungi, algae, and certain microscopic animals, such as rotifers. Many macroscopic animals and plants have microscopic juvenile stages. Some microbiologists also classify viruses (and viroids) as microorganisms, but others consider these as nonliving. In July 2016, scientists reported identifying a set of 355 genes from the last universal common ancestor (LUCA) of all life, including microorganisms, living on Earth. Marine microorganisms constitute about 70% of the biomass in the sea. They are crucial to nutrient recycling in ecosystems as they act as decomposers. A small proportion of microorganisms are pathogenic, causing disease and even death in plants and animals. As inhabitants of the largest environment on Earth, microbial marine systems drive changes in every global system. Microbes are responsible for virtually all the photosynthesis that occurs in the ocean, as well as the cycling of carbon, nitrogen, phosphorus and other nutrients and trace elements. Despite its diversity, microscopic life in the oceans is still poorly understood. For example, the role of viruses in marine ecosystems has barely been explored even in the beginning of the 21st century. Microbial mats are the earliest form of life on Earth for which there is good fossil evidence. The image shows a cyanobacterial-algal mat. Stromatolites are formed from microbial mats as microbes slowly move upwards to avoid being smothered by sediment. Sea spray containing marine microorganisms can be swept high into the atmosphere and may travel the globe before falling back to earth. The microorganism in the oceans include viruses, prokaryotes (Bacteria and Archaea), and protists. Bacteria and viruses are the most abundant, with a teaspoon (~5 mL) of seawater containing between about 1 million to 5 million bacteria, and 5 and 50 million viruses., Most of the viruses are bacteriophages, which are harmless to plants and animals, and are in fact essential to the regulation of saltwater and freshwater ecosystems. They infect and destroy bacteria in aquatic microbial communities, and are an important mechanism of recycling carbon and nutrient cycling in the marine environment, a process referred to the viral shunt. The organic molecules released from the dead bacterial cells stimulate fresh bacterial and algal growth. Viral activity may also contribute to the biological pump, the process whereby carbon is sequestered in the deep ocean. Marine bacteriophages are viruses that live as obligate parasitic agents in marine bacteria such as cyanobacteria. Their existence was discovered through electron microscopy and epifluorescence microscopy of ecological water samples, and later through metagenomic sampling of uncultured viral samples. The tailed bacteriophages appear to dominate marine ecosystems in number and diversity of organisms. However, viruses belonging to families Corticoviridae, Inoviridae and Microviridae are also known to infect diverse marine bacteria. Metagenomic evidence suggests that microviruses (icosahedral ssDNA phages) are particularly prevalent in marine habitats. Bacteriophages, viruses that are parasitic on bacteria, were first discovered in the early twentieth century. Scientists today consider that their importance in ecosystems, particularly marine ecosystems, has been underestimated, leading to these infectious agents being poorly investigated and their numbers and species biodiversity being greatly under reported. Microscopic organisms live in every part of the biosphere. The mass of prokaryote microorganisms — which includes bacteria and archaea, but not the nucleated eukaryote microorganisms — may be as much as 0.8 trillion tons of carbon (of the total biosphere mass, estimated at between 1 and 4 trillion tons). Barophilic marine microbes have been found at more than a depth of 10,000 m (33,000 ft; 6.2 mi) in the Mariana Trench, the deepest spot in the Earth's oceans. In fact, single-celled life forms have been found in the deepest part of the Mariana Trench, by the Challenger Deep, at depths of 11,034 m (36,201 ft; 6.856 mi). Other researchers reported related studies that microorganisms thrive inside rocks up to 580 m (1,900 ft; 0.36 mi) below the sea floor under 2,590 m (8,500 ft; 1.61 mi) of ocean off the coast of the northwestern United States, as well as 2,400 m (7,900 ft; 1.5 mi) beneath the seabed off Japan. The greatest known temperature at which microbial life can exist is 122 °C (252 °F) (Methanopyrus kandleri). On 20 August 2014, scientists confirmed the existence of microorganisms living 800 m (2,600 ft; 0.50 mi) below the ice of Antarctica. According to one researcher, "You can find microbes everywhere — they're extremely adaptable to conditions, and survive wherever they are." Scientists have conjectured a stream of airborne microorganisms circles the planet above weather systems but below commercial air lanes. Some of these peripatetic microorganisms are swept up from terrestrial dust storms, but most originate from marine microorganisms in sea spray. In 2018 a team of scientists reported that hundreds of millions of viruses and tens of millions of bacteria are deposited daily on every square meter around the planet. When not inside an infected cell or in the process of infecting a cell, viruses exist in the form of independent particles. These viral particles, also known as virions, consist of two or three parts: (i) the genetic material made from either DNA or RNA, long molecules that carry genetic information; (ii) a protein coat, called the capsid, which surrounds and protects the genetic material; and in some cases (iii) an envelope of lipids that surrounds the protein coat when they are outside a cell. The shapes of these virus particles range from simple helical and icosahedral forms for some virus species to more complex structures for others. Most virus species have virions that are too small to be seen with an optical microscope. The average virion is about one one-hundredth the size of the average bacterium. The origins of viruses in the evolutionary history of life are unclear: some may have evolved from plasmids—pieces of DNA that can move between cells—while others may have evolved from bacteria. In evolution, viruses are an important means of horizontal gene transfer, which increases genetic diversity. Viruses are considered by some to be a life form, because they carry genetic material, reproduce, and evolve through natural selection. However, they lack key characteristics (such as cell structure) that are generally considered necessary to count as life. Because they possess some but not all such qualities, viruses have been described as "organisms at the edge of life" and as replicators. Viruses are found wherever there is life and have probably existed since living cells first evolved. The origin of viruses is unclear because they do not form fossils, so molecular techniques have been used to compare the DNA or RNA of viruses and are a useful means of investigating how they arose. Viruses are now recognised as ancient and as having origins that pre-date the divergence of life into the three domains. Opinions differ on whether viruses are a form of life, or organic structures that interact with living organisms. They have been described as "organisms at the edge of life", since they resemble organisms in that they possess genes, evolve by natural selection, and reproduce by creating multiple copies of themselves through self-assembly. Although they have genes, they do not have a cellular structure, which is often seen as the basic unit of life. Viruses do not have their own metabolism, and require a host cell to make new products. They therefore cannot naturally reproduce outside a host cell. Viruses infecting bacteria, called bacteriophages, are a common and diverse group of viruses and are thought to be the most abundant form of biological entity in aquatic environments, because their hosts, bacteria, are typically the numerically dominant cellular life in the sea;– generally, there are about 1 million to 10 million viruses in each mL of seawater, or about ten times more double-stranded DNA viruses than there are cellular organisms, although estimates of viral abundance in seawater can vary over a wide range. Tailed bacteriophages appear to dominate marine ecosystems in number and diversity of organisms, and bacteriophages belonging to the families Corticoviridae, Inoviridae and Microviridae are also known to infect diverse marine bacteria. There are also archaean viruses, which replicate within archaea: these are double-stranded DNA viruses with unusual and sometimes unique shapes. These viruses have been studied in most detail in the thermophilic archaea, particularly the orders Sulfolobales and Thermoproteales. In terms of individual counts, tailed phage are the most abundant biological entities in the sea. Microorganisms make up about 70% of the biomass in the sea. It is estimated that viruses kill approximately 20% of this biomass each day; consequently, viruses are one of the most important mechanisms of recycling carbon and nutrient cycling in the marine environment. This can have consequent effects for the biological pump, the process whereby carbon is sequestered into the deep ocean. Viruses can also be a primary factor in the rapid destruction of algal blooms; such blooms can be detrimental to other marine life.. The number of viruses in the oceans decreases further offshore and deeper into the water, where there are fewer host organisms. Viruses are an important natural means of transferring genes between different species, which increases genetic diversity and drives evolution. It is thought that viruses played a central role in the early evolution, before the diversification of bacteria, archaea and eukaryotes, at the time of the last universal common ancestor of life on Earth. Viruses are still one of the largest reservoirs of unexplored genetic diversity on Earth. Bacteria constitute a large domain of prokaryotic microorganisms. Typically a few micrometres in length, bacteria have a number of shapes, ranging from spheres to rods and spirals. Bacteria were among the first life forms to appear on Earth, and are present in most of its habitats. Bacteria inhabit soil, water, acidic hot springs, radioactive waste, and the deep portions of Earth's crust. Bacteria also live in symbiotic and parasitic relationships with plants and animals. The ancestors of modern bacteria were unicellular microorganisms that were the first forms of life to appear on Earth, about 4 billion years ago. For about 3 billion years, most organisms were microscopic, and bacteria and archaea were the dominant forms of life. 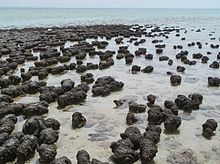 Although bacterial fossils exist, such as stromatolites, their lack of distinctive morphology prevents them from being used to examine the history of bacterial evolution, or to date the time of origin of a particular bacterial species. However, gene sequences can be used to reconstruct the bacterial phylogeny, and these studies indicate that bacteria diverged first from the archaeal/eukaryotic lineage. Bacteria were also involved in the second great evolutionary divergence, that of the archaea and eukaryotes. Here, eukaryotes resulted from the entering of ancient bacteria into endosymbiotic associations with the ancestors of eukaryotic cells, which were themselves possibly related to the Archaea. This involved the engulfment by proto-eukaryotic cells of alphaproteobacterial symbionts to form either mitochondria or hydrogenosomes, which are still found in all known Eukarya. Later on, some eukaryotes that already contained mitochondria also engulfed cyanobacterial-like organisms. This led to the formation of chloroplasts in algae and plants. There are also some algae that originated from even later endosymbiotic events. Here, eukaryotes engulfed a eukaryotic algae that developed into a "second-generation" plastid. This is known as secondary endosymbiosis. Chloroplasts, such as the chloroplasts of this glaucophyte, may have originated from cyanobacteria. Bacteria can be beneficial. This Pompeii worm, an extremophile found only at hydrothermal vents, has a protective cover of bacteria. The largest known bacterium, the marine Thiomargarita namibiensis, can be visible to the naked eye and sometimes attains 0.75 mm (750 μm). 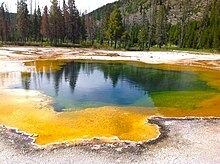 Archaea were initially viewed as extremophiles living in harsh environments, such as the yellow archaea pictured here in a hot spring, but they have since been found in a much broader range of habitats. The archaea (Greek for ancient ) constitute a domain and kingdom of single-celled microorganisms. These microbes are prokaryotes, meaning they have no cell nucleus or any other membrane-bound organelles in their cells. Archaea were initially classified as bacteria, but this classification is outdated. Archaeal cells have unique properties separating them from the other two domains of life, Bacteria and Eukaryota. The Archaea are further divided into multiple recognized phyla. Classification is difficult because the majority have not been isolated in the laboratory and have only been detected by analysis of their nucleic acids in samples from their environment. Archaea and bacteria are generally similar in size and shape, although a few archaea have very strange shapes, such as the flat and square-shaped cells of Haloquadratum walsbyi. Despite this morphological similarity to bacteria, archaea possess genes and several metabolic pathways that are more closely related to those of eukaryotes, notably the enzymes involved in transcription and translation. Other aspects of archaeal biochemistry are unique, such as their reliance on ether lipids in their cell membranes, such as archaeols. Archaea use more energy sources than eukaryotes: these range from organic compounds, such as sugars, to ammonia, metal ions or even hydrogen gas. Salt-tolerant archaea (the Haloarchaea) use sunlight as an energy source, and other species of archaea fix carbon; however, unlike plants and cyanobacteria, no known species of archaea does both. Archaea reproduce asexually by binary fission, fragmentation, or budding; unlike bacteria and eukaryotes, no known species forms spores. Unlike viruses and bacteria, no known archaea is a pathogen. Archaea are particularly numerous in the oceans, and the archaea in plankton may be one of the most abundant groups of organisms on the planet. Archaea are a major part of Earth's life and may play roles in both the carbon cycle and the nitrogen cycle. Halobacteria, found in water saturated or nearly saturated with salt, are now recognized as being archaea. All living organisms can be grouped as either prokaryotes or eukaryotes. Life originated as single-celled prokaryotes and later evolved into the more complex eukaryotes. In contrast to prokaryotic cells, eukaryotic cells are highly organised. Prokaryotes are the bacteria and archaea, while eukaryotes are the other life forms — protists, plants, fungi and animals. Plants, fungi and animals are usually multi-celled. Protists are eukaryotes that cannot be classified as plants, fungi or animals. They are usually single-celled and microscopic. Protists include amoebae, ciliates, red algae, euglena, phytoplankton such as diatoms and dinoflagellates, and slime molds. 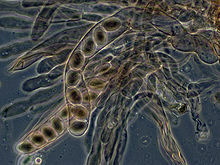 Several algae species are multicellular protists, and some marine slime molds have unique life cycles that involve switching between unicellular, colonial, and multicellular forms. Protists are a highly diverse group of organisms currently organised into 18 phyla, but they are not easy to classify. Studies have shown a high protist diversity exists in oceans, deep sea-vents and river sediments, which suggests a large number of eukaryotic microbial communities have yet to be discovered. Silicified cell wall of a diatom Amphora sp. Algae can grow as single cells, or in long chains of cells. Green algae are a large group of photosynthetic eukaryotes that include many microscopic organisms. Green algae include unicellular and colonial flagellates as well as various colonial, coccoid, and filamentous forms. There are about 6000 species. Phytoplankton are the foundation of the oceanic food chain and account for half of all photosynthetic activity on Earth. Lichen on a rock in a marine splash zone. Lichens are mutualistic associations between a fungus and an alga or cyanobacterium. Over 1500 species of fungi are known from marine environments. These are parasitic on marine algae or animals, or are saprobes on algae, corals, protozoan cysts, sea grasses, wood and other substrata, and can also be found in sea foam. Spores of many species have special appendages that facilitate attachment to the substratum. A very diverse range of unusual secondary metabolites is produced by marine fungi. Marine yeasts are also found, even in deep-sea environments. 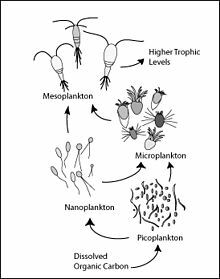 Mycoplankton are saprotropic members of the plankton communities of marine and freshwater ecosystems. They are composed of filamentous free-living fungi and yeasts that are associated with planktonic particles or phytoplankton. Similar to bacterioplankton, these aquatic fungi play a significant role in heterotrophic mineralization and nutrient cycling. Mycoplankton can be up to 20 mm in diameter and over 50 mm in length. In a typical milliliter of seawater, there are approximately 103 to 104 fungal cells. This number is greater in coastal ecosystems and estuaries due to nutritional runoff from terrestrial communities. The greatest diversity and number of species of mycoplankton is found in surface waters (< 1000 m), and the vertical profile depends on the abundance of phytoplankton. Furthermore, this difference in distribution may vary between seasons due to nutrient availability. Marine fungi survive in a constant oxygen deficient environment, and therefore depend on oxygen diffusion by turbulence and oxygen generated by photosynthetic organisms. Most mycoplankton species are higher fungi. Lichens are mutualistic associations between a fungus, usually an ascomycete, and an alga or a cyanobacterium. 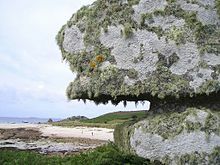 Several lichens are found in marine environments. Many more occur in the splash zone, where they occupy different vertical zones depending on how tolerant they are to submersion. Fossil marine lichens 600 million years old have been discovered in the late Neoproterozoic marine phosphate rocks in the sedimentary, fossil-rich Doushantuo Formation in China. According to fossil records, fungi date back to the late Proterozoic era 900-570 million years ago. It has been hypothesized that mycoplankton evolved from terrestrial fungi, likely in the Paleozoic era (390 million years ago). As juveniles, animals develop from microscopic stages, which can include eggs and larvae. At least one microscopic animal group, the parasitic cnidarian Myxozoa, is unicellular in its adult form, and includes marine species. Other adult marine microanimals are multicellular. Microscopic adult arthropods are more commonly found inland in freshwater, but there are marine species as well. Microscopic adult marine crustaceans include some copepods, cladocera and water bears. Some marine nematodes and rotifers are also too small to be seen with the naked eye, as are many loricifera, including the recently discovered anaerobic species that spend their lives in an anoxic environment. Copepods contribute more to the secondary productivity and carbon sink of the world oceans than any other group of organisms. ^ Madigan M; Martinko J, eds. (2006). Brock Biology of Microorganisms (13th ed.). Pearson Education. p. 1096. ISBN 978-0-321-73551-5. ^ Rybicki EP (1990). "The classification of organisms at the edge of life, or problems with virus systematics". South African Journal of Science. 86: 182–6. ISSN 0038-2353. ^ Lwoff A (1956). "The concept of virus". Journal of General Microbiology. 17 (2): 239–53. doi:10.1099/00221287-17-2-239. PMID 13481308. ^ Wade, Nicholas (25 July 2016). "Meet Luca, the Ancestor of All Living Things". New York Times. Retrieved 25 July 2016. ^ "Functions of global ocean microbiome key to understanding environmental changes". www.sciencedaily.com. University of Georgia. 10 December 2015. Retrieved 11 December 2015. ^ Suttle, C.A. (2005). "Viruses in the Sea". Nature. 437 (9): 356–361. doi:10.1038/nature04160. PMID 16163346. ^ a b Wommack KE, Colwell RR. Virioplankton: viruses in aquatic ecosystems. Microbiology and Molecular Biology Reviews. 2000;64(1):69–114. doi:10.1128/MMBR.64.1.69-114.2000. PMID 10704475. ^ a b Suttle CA. Viruses in the sea. Nature. 2005;437:356–361. doi:10.1038/nature04160. PMID 16163346. ^ Wilhelm SW, Suttle CA. 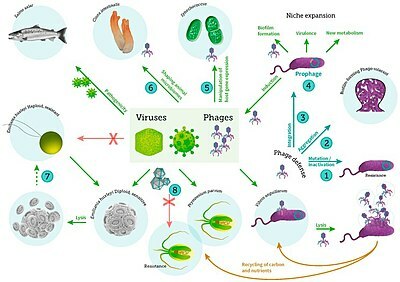 Viruses and nutrient cycles in the sea: Viruses play critical roles in the structure and function of aquatic food webs. Bioscience. 1999;49:781–788. doi:10.2307/1313569. ^ a b c d Suttle CA. Marine viruses—major players in the global ecosystem. Nature Reviews Microbiology. 2007;5(10):801–12. doi:10.1038/nrmicro1750. PMID 17853907. ^ a b c d Mann, NH (17 May 2005). "The Third Age of Phage". PLoS Biology. 3 (5): 753–755. doi:10.1371/journal.pbio.0030182. PMC 1110918. PMID 15884981. ^ Wommack, K. Eric; Russell T. Hill; Terri A. Muller; Rita R. Colwell (April 1996). "Effects of sunlight on bacteriophage viability and structure". Applied and Environmental Microbiology. 62 (4): 1336–1341. PMC 167899. PMID 8919794. ^ Krupovic M, Bamford DH (2007). "Putative prophages related to lytic tailless marine dsDNA phage PM2 are widespread in the genomes of aquatic bacteria". BMC Genomics. 8: 236. doi:10.1186/1471-2164-8-236. PMC 1950889. PMID 17634101. ^ Xue H, Xu Y, Boucher Y, Polz MF (2012). "High frequency of a novel filamentous phage, VCY φ, within an environmental Vibrio cholerae population". Applied and Environmental Microbiology. 78 (1): 28–33. doi:10.1128/AEM.06297-11. PMC 3255608. PMID 22020507. ^ a b c Roux S, Krupovic M, Poulet A, Debroas D, Enault F (2012). "Evolution and diversity of the Microviridae viral family through a collection of 81 new complete genomes assembled from virome reads". PLOS ONE. 7 (7): e40418. Bibcode:2012PLoSO...740418R. doi:10.1371/journal.pone.0040418. PMC 3394797. PMID 22808158. ^ Kellogg, CA; JB Rose; SC Jiang; and JM Thurmond; JH Paul (1995). "Genetic diversity of related vibriophages isolated from marine environments around Florida and Hawaii, USA". Marine Ecology Progress Series. 120 (1–3): 89–98. doi:10.3354/meps120089. ^ Staff (2014). "The Biosphere". Aspen Global Change Institute. Retrieved 10 November 2014. ^ Takamia; et al. (1997). "Microbial flora in the deepest sea mud of the Mariana Trench". FEMS Microbiology Letters. 152 (2): 279–285. doi:10.1111/j.1574-6968.1997.tb10440.x. ^ a b c Choi, Charles Q. (17 March 2013). "Microbes Thrive in Deepest Spot on Earth". LiveScience. Retrieved 17 March 2013. ^ Glud, Ronnie; Wenzhöfer, Frank; Middelboe, Mathias; Oguri, Kazumasa; Turnewitsch, Robert; Canfield, Donald E.; Kitazato, Hiroshi (17 March 2013). "High rates of microbial carbon turnover in sediments in the deepest oceanic trench on Earth". Nature Geoscience. 6 (4): 284–288. Bibcode:2013NatGe...6..284G. doi:10.1038/ngeo1773. ^ Oskin, Becky (14 March 2013). "Intraterrestrials: Life Thrives in Ocean Floor". LiveScience. Retrieved 17 March 2013. ^ Morelle, Rebecca (15 December 2014). "Microbes discovered by deepest marine drill analysed". BBC News. Retrieved 15 December 2014. ^ Takai K; Nakamura K; Toki T; Tsunogai U; et al. (2008). "Cell proliferation at 122°C and isotopically heavy CH4 production by a hyperthermophilic methanogen under high-pressure cultivation". Proceedings of the National Academy of Sciences of the United States of America. 105 (31): 10949–54. doi:10.1073/pnas.0712334105. PMC 2490668. PMID 18664583. ^ Fox, Douglas (20 August 2014). "Lakes under the ice: Antarctica's secret garden". Nature. 512 (7514): 244–246. Bibcode:2014Natur.512..244F. doi:10.1038/512244a. PMID 25143097. ^ Mack, Eric (20 August 2014). "Life Confirmed Under Antarctic Ice; Is Space Next?". Forbes. Retrieved 21 August 2014. ^ Living Bacteria Are Riding Earth’s Air Currents Smithsonian Magazine, 11 January 2016. ^ Robbins, Jim (13 April 2018). "Trillions Upon Trillions of Viruses Fall From the Sky Each Day". The New York Times. Retrieved 14 April 2018. ^ Reche, Isabel; D’Orta, Gaetano; Mladenov, Natalie; Winget, Danielle M; Suttle, Curtis A (29 January 2018). "Deposition rates of viruses and bacteria above the atmospheric boundary layer". ISME Journal. 12 (4): 1154–1162. doi:10.1038/s41396-017-0042-4. PMC 5864199. PMID 29379178. ^ Koonin EV, Senkevich TG, Dolja VV. The ancient Virus World and evolution of cells. Biology Direct. 2006;1:29. doi:10.1186/1745-6150-1-29. PMID 16984643. ^ a b Canchaya C, Fournous G, Chibani-Chennoufi S, Dillmann ML, Brüssow H. Phage as agents of lateral gene transfer. Current Opinion in Microbiology. 2003;6(4):417–24. doi:10.1016/S1369-5274(03)00086-9. PMID 12941415. ^ a b Rybicki, EP. The classification of organisms at the edge of life, or problems with virus systematics. South African Journal of Science. 1990;86:182–186. ^ a b Koonin, E. V.; Starokadomskyy, P. (October 2016). "Are viruses alive? The replicator paradigm sheds decisive light on an old but misguided question". Studies in History and Philosophy of Science Part C: Studies in History and Philosophy of Biological and Biomedical Sciences. 59: 125–134. doi:10.1016/j.shpsc.2016.02.016. PMC 5406846. PMID 26965225. ^ Iyer LM, Balaji S, Koonin EV, Aravind L. Evolutionary genomics of nucleo-cytoplasmic large DNA viruses. Virus Research. 2006;117(1):156–84. doi:10.1016/j.virusres.2006.01.009. PMID 16494962. ^ Sanjuán R, Nebot MR, Chirico N, Mansky LM, Belshaw R. Viral mutation rates. Journal of Virology. 2010;84(19):9733–48. doi:10.1128/JVI.00694-10. PMID 20660197. ^ Mahy WJ & Van Regenmortel MHV (eds). Desk Encyclopedia of General Virology. Oxford: Academic Press; 2009. ISBN 0-12-375146-2. p. 28. ^ Holmes EC. Viral evolution in the genomic age. PLoS Biology. 2007;5(10):e278. doi:10.1371/journal.pbio.0050278. PMID 17914905. ^ Wimmer E, Mueller S, Tumpey TM, Taubenberger JK. Synthetic viruses: a new opportunity to understand and prevent viral disease. Nature Biotechnology. 2009;27(12):1163–72. doi:10.1038/nbt.1593. PMID 20010599. ^ Bergh O, Børsheim KY, Bratbak G, Heldal M. High abundance of viruses found in aquatic environments. Nature. 1989;340(6233):467–8. doi:10.1038/340467a0. PMID 2755508. Bibcode: 1989Natur.340..467B. ^ Wigington CH, Sonderegger D, Brussaard CPD, Buchan A, Finke JF, Fuhrman JA, Lennon JT, Middelboe M, Suttle CA, Stock C, Wilson WH, Wommack KE, Wilhelm SW, Weitz JS. Re-examination of the relationship between marine virus and microbial cell abundances. Nature Microbiology. 2016;1:15024. doi:10.1038/nmicrobiol.2015.24. PMID 27572161. ^ Lawrence CM, Menon S, Eilers BJ, et al.. Structural and functional studies of archaeal viruses. Journal of Biological Chemistry. 2009;284(19):12599–603. doi:10.1074/jbc.R800078200. PMID 19158076. ^ Prangishvili D, Forterre P, Garrett RA. Viruses of the Archaea: a unifying view. Nature Reviews Microbiology. 2006;4(11):837–48. doi:10.1038/nrmicro1527. PMID 17041631. ^ Prangishvili D, Garrett RA. Exceptionally diverse morphotypes and genomes of crenarchaeal hyperthermophilic viruses. Biochemical Society Transactions. 2004;32(Pt 2):204–8. doi:10.1042/BST0320204. PMID 15046572. ^ Suttle CA. Viruses in the sea. Nature. 2005;437(7057):356–61. doi:10.1038/nature04160. PMID 16163346. Bibcode: 2005Natur.437..356S. ^ www.cdc.gov. Harmful Algal Blooms: Red Tide: Home [Retrieved 2014-12-19]. ^ Forterre P, Philippe H. The last universal common ancestor (LUCA), simple or complex?. The Biological Bulletin. 1999;196(3):373–5; discussion 375–7. doi:10.2307/1542973. PMID 11536914. ^ Fredrickson JK, Zachara JM, Balkwill DL, Kennedy D, Li SM, Kostandarithes HM, Daly MJ, Romine MF, Brockman FJ (2004). "Geomicrobiology of high-level nuclear waste-contaminated vadose sediments at the Hanford site, Washington state". Applied and Environmental Microbiology. 70 (7): 4230–41. doi:10.1128/AEM.70.7.4230-4241.2004. PMC 444790. PMID 15240306. ^ Woese CR, Kandler O, Wheelis ML (1990). "Towards a natural system of organisms: proposal for the domains Archaea, Bacteria, and Eucarya". Proceedings of the National Academy of Sciences of the United States of America. 87 (12): 4576–9. Bibcode:1990PNAS...87.4576W. doi:10.1073/pnas.87.12.4576. PMC 54159. PMID 2112744. ^ Schopf JW (1994). "Disparate rates, differing fates: tempo and mode of evolution changed from the Precambrian to the Phanerozoic". Proceedings of the National Academy of Sciences of the United States of America. 91 (15): 6735–42. Bibcode:1994PNAS...91.6735S. doi:10.1073/pnas.91.15.6735. PMC 44277. PMID 8041691. ^ DeLong EF, Pace NR (2001). "Environmental diversity of bacteria and archaea". Systematic Biology. 50 (4): 470–8. CiteSeerX 10.1.1.321.8828. doi:10.1080/106351501750435040. PMID 12116647. ^ Brown JR, Doolittle WF (1997). "Archaea and the prokaryote-to-eukaryote transition". Microbiology and Molecular Biology Reviews. 61 (4): 456–502. PMC 232621. PMID 9409149. ^ Dyall, Sabrina D.; Brown, Mark T.; Johnson, Patricia J. (9 April 2004). "Ancient Invasions: From Endosymbionts to Organelles". Science. 304 (5668): 253–257. Bibcode:2004Sci...304..253D. doi:10.1126/science.1094884. ISSN 0036-8075. PMID 15073369. ^ Poole AM, Penny D (2007). "Evaluating hypotheses for the origin of eukaryotes". BioEssays. 29 (1): 74–84. doi:10.1002/bies.20516. PMID 17187354. ^ Lang BF, Gray MW, Burger G (1999). "Mitochondrial genome evolution and the origin of eukaryotes". Annual Review of Genetics. 33: 351–97. doi:10.1146/annurev.genet.33.1.351. PMID 10690412. ^ McFadden GI (1999). "Endosymbiosis and evolution of the plant cell". Current Opinion in Plant Biology. 2 (6): 513–9. doi:10.1016/S1369-5266(99)00025-4. PMID 10607659. ^ Patrick J. Keeling (2004). "Diversity and evolutionary history of plastids and their hosts". American Journal of Botany. 91 (10): 1481–1493. doi:10.3732/ajb.91.10.1481. PMID 21652304. ^ "The largest Bacterium: Scientist discovers new bacterial life form off the African coast". Max Planck Institute for Marine Microbiology. 8 April 1999. Archived from the original on 20 January 2010. ^ "List of Prokaryotic names with Standing in Nomenclature - Genus Thiomargarita". LPSN. Archived from the original on 28 August 2009. ^ Bang C, Schmitz RA (2015). "Archaea associated with human surfaces: not to be underestimated". FEMS Microbiology Reviews. 39 (5): 631–48. doi:10.1093/femsre/fuv010. PMID 25907112. ^ Archaea Online Etymology Dictionary. Retrieved 17 August 2016. ^ Pace NR (May 2006). "Time for a change". Nature. 441 (7091): 289. Bibcode:2006Natur.441..289P. doi:10.1038/441289a. PMID 16710401. ^ Stoeckenius W (1 October 1981). "Walsby's square bacterium: fine structure of an orthogonal procaryote". Journal of Bacteriology. 148 (1): 352–60. PMC 216199. PMID 7287626. ^ Devreotes P (1989). "Dictyostelium discoideum: a model system for cell-cell interactions in development". Science. 245 (4922): 1054–8. Bibcode:1989Sci...245.1054D. doi:10.1126/science.2672337. PMID 2672337. ^ Cavalier-Smith T (December 1993). "Kingdom protozoa and its 18 phyla". Microbiological Reviews. 57 (4): 953–94. PMC 372943. PMID 8302218. ^ Corliss JO (1992). "Should there be a separate code of nomenclature for the protists?". BioSystems. 28 (1–3): 1–14. doi:10.1016/0303-2647(92)90003-H. PMID 1292654. ^ Slapeta J, Moreira D, López-García P (2005). "The extent of protist diversity: insights from molecular ecology of freshwater eukaryotes". Proceedings of the Royal Society B: Biological Sciences. 272 (1576): 2073–81. doi:10.1098/rspb.2005.3195. PMC 1559898. PMID 16191619. ^ Moreira D, López-García P (2002). "The molecular ecology of microbial eukaryotes unveils a hidden world" (PDF). Trends in Microbiology. 10 (1): 31–8. doi:10.1016/S0966-842X(01)02257-0. PMID 11755083. ^ Thomas, David C. (2002). Seaweeds. London: Natural History Museum. ISBN 978-0-565-09175-0. ^ Hyde, K.D. ; E.B.J. Jones; E. Leaño; S.B. Pointing; A.D. Poonyth; L.L.P. Vrijmoed (1998). "Role of fungi in marine ecosystems". Biodiversity and Conservation. 7 (9): 1147–1161. doi:10.1023/A:1008823515157. ^ Hyde, K.D. ; E.B.J. Jones (1989). "Spore attachment in marine fungi". Botanica Marina. 32 (3): 205–218. doi:10.1515/botm.1989.32.3.205. ^ San-Martín, A.; S. Orejanera; C. Gallardo; M. Silva; J. Becerra; R. Reinoso; M.C. Chamy; K. Vergara; J. Rovirosa (2008). "Steroids from the marine fungus Geotrichum sp". Journal of the Chilean Chemical Society. 53 (1): 1377–1378. ^ Bass D, Howe A, Brown N, Barton H, Demidova M, Michelle H, Li L, Sanders H, Watkinson SC, Willcock S, Richards TA (2007). "Yeast forms dominate fungal diversity in the deep oceans". Proceedings of the Royal Society B. 274 (1629): 3069–3077. doi:10.1098/rspb.2007.1067. PMC 2293941. PMID 17939990. ^ Kutty SN, Philip R (2008). "Marine yeasts—a review" (PDF). Yeast. 25 (7): 465–483. doi:10.1002/yea.1599. PMID 18615863. ^ Jones, E.B.G., Hyde, K.D., & Pang, K.-L., eds. (2014). Freshwater fungi: and fungal-like organisms. Berlin/Boston: De Gruyter. ^ Jones, E.B.G. ; Pang, K.-L., eds. (2012). Marine Fungi, and Fungal-like Organisms. Marine and Freshwater Botany. Berlin, Boston: De Gruyter (published August 2012). doi:10.1515/9783110264067. ISBN 978-3-11-026406-7. Retrieved 3 September 2015. ^ "Distribution and Diversity of Planktonic Fungi in the West Pacific Warm Pool". doi:10.1371/journal.pone.0101523.s001. ^ Wang, G.; Wang, X.; Liu, X.; Li, Q. (2012). "Diversity and biogeochemical function of planktonic fungi in the ocean". In Raghukumar, C. (ed.). Biology of marine fungi. Berlin, Heidelberg: Springer-Verlag. pp. 71–88. doi:10.1007/978-3-642-23342-5. ISBN 978-3-642-23341-8. Retrieved 3 September 2015. ^ Damare, Samir; Raghukumar, Chandralata (11 November 2007). "Fungi and Macroaggregation in Deep-Sea Sediments". Microbial Ecology. 56 (1): 168–177. doi:10.1007/s00248-007-9334-y. ISSN 0095-3628. PMID 17994287. ^ Kubanek, Julia; Jensen, Paul R.; Keifer, Paul A.; Sullards, M. Cameron; Collins, Dwight O.; Fenical, William (10 June 2003). "Seaweed resistance to microbial attack: A targeted chemical defense against marine fungi". Proceedings of the National Academy of Sciences. 100 (12): 6916–6921. doi:10.1073/pnas.1131855100. ISSN 0027-8424. PMC 165804. PMID 12756301. ^ a b Gao, Zheng; Johnson, Zackary I.; Wang, Guangyi (30 July 2009). "Molecular characterization of the spatial diversity and novel lineages of mycoplankton in Hawaiian coastal waters". The ISME Journal. 4 (1): 111–120. doi:10.1038/ismej.2009.87. ISSN 1751-7362. PMID 19641535. ^ Panzer, Katrin; Yilmaz, Pelin; Weiß, Michael; Reich, Lothar; Richter, Michael; Wiese, Jutta; Schmaljohann, Rolf; Labes, Antje; Imhoff, Johannes F. (30 July 2015). "Identification of Habitat-Specific Biomes of Aquatic Fungal Communities Using a Comprehensive Nearly Full-Length 18S rRNA Dataset Enriched with Contextual Data". PLoS ONE. 10 (7): e0134377. doi:10.1371/journal.pone.0134377. PMC 4520555. PMID 26226014. ^ Gutierrez, Marcelo H; Pantoja, Silvio; Quinones, Renato a and Gonzalez, Rodrigo R. First record of flamentous fungi in the coastal upwelling ecosystem off central Chile. Gayana (Concepc.) [online]. 2010, vol.74, n.1, pp. 66-73. ISSN 0717-6538. ^ a b Sridhar, K.R. (2009). "10. Aquatic fungi – Are they planktonic?". Plankton Dynamics of Indian Waters. Jaipur, India: Pratiksha Publications. pp. 133–148. ^ Species of Higher Marine Fungi Archived 22 April 2013 at the Wayback Machine University of Mississippi. Retrieved 2012-02-05. ^ Freshwater and marine lichen-forming fungi Retrieved 2012-02-06. ^ Yuan X, Xiao S & Taylor TN. (2005). "Lichen-Like Symbiosis 600 Million Years Ago". Science. 308 (5724): 1017–1020. doi:10.1126/science.1111347. PMID 15890881. ^ Jones, E. B. Gareth; Pang, Ka-Lai (31 August 2012). Marine Fungi: and Fungal-like Organisms. Walter de Gruyter. ISBN 9783110264067. ^ Janet Fang (6 April 2010). "Animals thrive without oxygen at sea bottom". Nature. 464 (7290): 825. doi:10.1038/464825b. PMID 20376121. ^ "Briny deep basin may be home to animals thriving without oxygen". Science News. 23 September 2013. This page was last edited on 24 March 2019, at 02:31 (UTC).